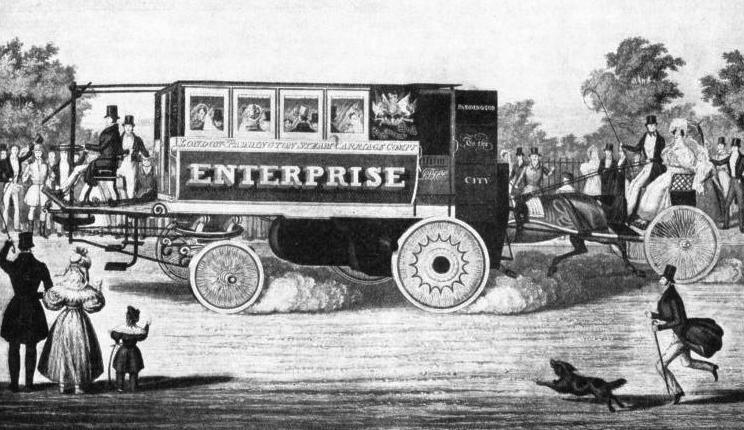 BUILT IN 1833 for the steam-driven bus service between Paddington and the Bank, in London, the Enterprise was one of ten successful steam coaches built by Walter Hancock. This was the first regular motor omnibus service to be operated in any city. The coachwork of the Enterprise, which had its engine at the back, was based on the design of horse-drawn omnibuses. THE earliest attempts at producing a locomotive - that is, any form of engine that could propel itself - concerned road vehicles. In the earliest days of the steam engine, when James Watt was a well-known contemporary figure, the only railways were light tramroads, often with wooden baulks for rails, used solely for local transport in the neighbourhood of collieries and other mines. Horses provided the motive power of these tramroads. Land transport in its widest, most general sense was carried out entirely on the turnpike roads, and the first attempts to mechanize it were expressed not in steam trains, but in steam coaches. Before and during the eighteen-thirties, when railways were becoming established and their possibilities were fully realized, enterprising engineers designed and built some successful steam carriages, which deserved to be called the first motor coaches. The first engineer in the world to produce a workable locomotive was the Frenchman Nicolas Cugnot. His invention took the form of a steam traction engine, mounted on ironshod wheels. He aimed at building an appliance which could haul heavy artillery. For such an engine any ambitious Government might be prepared to pay highly. Cugnot’s traction engine appears a crude and curious machine to-day, but the inventor had to work alone. Nobody had preceded him in this branch of engineering. 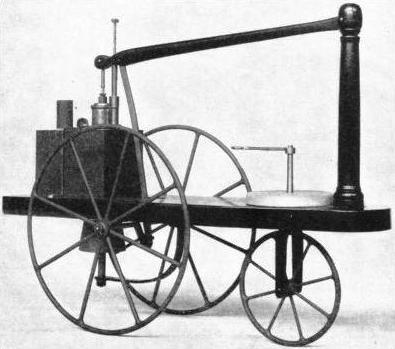 Cugnot’s first experimental engine, or steam carriage, appeared in 1769. It ran on three wheels - a driving wheel in front and two ordinary gun wheels on either side of the frame. The little two-cylinder engine was mounted directly over the driving wheel and derived its motive force from a boiler forming the nose of the vehicle. This boiler resembled a large copper kettle without a handle. The steam pipe took the place of a spout and a small firebox was placed inside the bottom of the “kettle”, with a flue passing through it to two small chimneys. The pressure was low, but Cugnot succeeded in making his strange machine propel itself. It was a far call from this to the racing car of to-day or to the heavy crawler tractor, yet Cugnot’s engine can be justifiably claimed as the common father of both. People at the time thought the inventor was mad, but he realized the possibilities of his invention. For the first time, man had succeeded in making a vehicle move under its own power. Encouraged by this first attempt, the ingenious Frenchman designed another and larger steam carriage, exemplifying the same principles of design as before. The French Government assisted him and in 1770 he produced a steam carriage which, with several passengers, travelled along a public street at a slow walking pace. 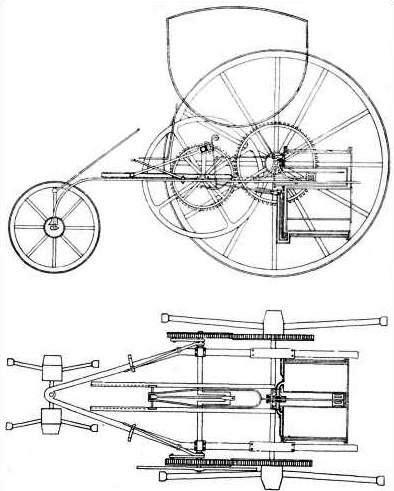 The driving wheel, with the entire engine and boiler that it supported, was mounted on a pivot, by which Cugnot steered his machine. He did not find steering easy, and had not gone far before his carriage refused to answer the helm and charged a wall. At this, people became nervous, and Cugnot was admonished severely by the authorities. He did not despair, though the French Government became noticeably cooler. But the faulty steering gear was to give trouble again. Cugnot’s steam carriage was unstable and its instability was aggravated by the fact that all the heavy machinery rested on the single wheel in front. As soon as he attempted to drive it round a street corner, it heeled over and fell on its side. The authorities thereupon confiscated the carriage and imprisoned the unfortunate father of modern locomotion. The original 1770 machine is still to be seen at the Conservatoire des Arts et Metiers, Paris. In 1788 a Yorkshireman named Robert Fourness designed a three-cylinder steam traction engine, but his death ended the remarkable experiment before it could be developed. Richard Trevithick is rightly claimed as the father of the railway engine. He built the first locomotive to run on rails and set it to work on the Penydarran tramroad in South Wales in 1801. But several years before that he had been experimenting with steam carriages for use on roads. As the eighteenth merged into the nineteenth century, Trevithick was experimenting with a model steam traction engine. It had a horizontal boiler mounted on three wheels, of which the larger two were the driving wheels. The single cylinder drove on to a crankshaft with a huge flywheel, whence gear wheels transmitted the motion to the driving axle. The inventor received little encouragement. Trevithick, however, found an able partner in young Andrew Vivian, and these two set to work to produce a real road coach, one that could travel along the highways and carry passengers. Working at Redruth, in Cornwall, where Trevithick lived, they produced an enlarged version of Trevithick’s pioneer effort, and mounted a small carriage body over the engine and between the two huge driving wheels. One day in 1801 this prodigy steamed out of the Cornish town of Camborne in the small hours of the morning, with Trevithick and Vivian on board. The first person they met was the keeper at the toll gate, who took one look at the panting monster, muttered something about the Devil and there being no charge, and hurriedly disappeared into the toll house. Trevithick and Vivian drove their carriage, under its own steam, from Camborne to Plymouth, covering some seventy miles of rough Cornish roads. At Plymouth it was placed on board ship and conveyed to London. The carriage excited great wonder but no profitable enthusiasm for steam carriages on roads. At the same time it gained for Trevithick the reputation through which he was commissioned to build the first railway locomotive. Trevithick was not, however, the first man in England to make a steam engine run along under its own power. William Murdock, the pioneer of gas lighting, who was responsible for the working of Boulton and Watt’s mining engines in Cornwall, built a simple little three-wheeled locomotive with a single cylinder, a walking beam for transmission, and a single-flue boiler fired by a spirit lamp. Boulton and Watt actively discouraged him, fearing that so good an engineer might slip away from them once he had tasted the fruits of his originality. Murdock set off for London with his model, but unfortunately met Boulton on the way at Exeter. Boulton afterwards wrote to James Watt: “He hath unpacked his carriage and made it travel a mile . . . making it carry the fire shovel, poker and tongs. I think it fortunate that I met him, as I am persuaded I can cure hint of the disorder, or turn the evil to good.” That was in September 1786. Many years later, when the building of railway locomotives had been begun, certain engineers were experimenting with a remarkable alternative, in the form of high-speed road coaches driven by light, high-pressure steam engines, and running for relatively long distances on the country’s great turnpikes. DRAWINGS OF TREVITHICK’S STEAM COACH furnished with his patent specification in 1802. The drawings represent a coach built in the previous year. Trevithick and his partner, Andrew Vivian, drove the coach from Camborne, Cornwall, to Plymouth. Several names stand out among those of early nineteenth-century engineers who did their best to popularize mechanical transport on the roads. One of these men was Mr. (afterwards Sir) Goldsworthy Gurney, whose experiments began in 1827, ten years before the accession of Queen Victoria. He was the first man to build a self-propelling, or motor coach to carry fare-paying passengers. 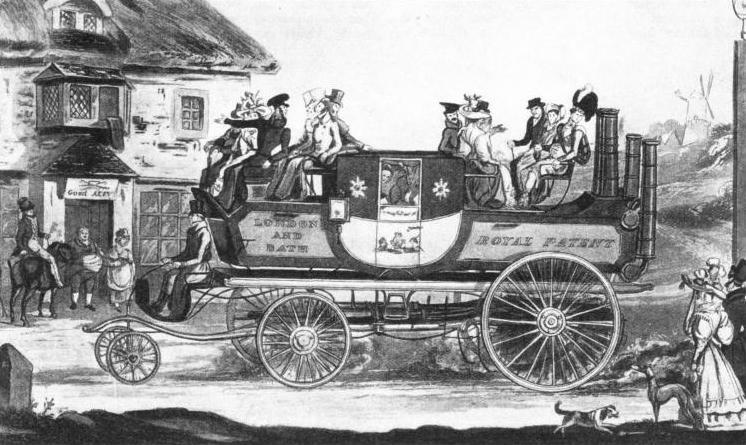 Gurney’s first coach was similar in appearance to a large stage coach, with the addition of a third pair of wheels in front, where the horses would have been. These leading wheels were designed to assist in steering the vehicle, and were controlled by a kind of reversed tiller swung by a man sitting on the front seat. Gurney placed his engine at the back. He had various reasons for this. First, the trailing axle, being the driving axle, gave a maximum possible weight for adhesion. Secondly, the fumes from the boiler flues were in no way likely to annoy the passengers. Thirdly, as the coach body screened the engine, it was less likely to frighten horses on the road, an important consideration in days when there were thousands of high-spirited horses, none of which had ever seen a steam engine in any form. There were disadvantages in the rearward position for the engine. Foremost among these was that the driver, who sat guiding the coach in front, could not keep an eye on the engine. The engine proper was below the level of the coachwork, with its driving shaft geared to the axle. In addition, Gurney provided a series of “struts” for giving assistance when climbing steep hills. These “struts” were legs to which motion was imparted through connecting rods, and which dug into the road surface underneath. They hindered rather than assisted the coach, and the inventor removed them. The coach climbed hills more easily with the unassisted aid of its driving wheels. For a steam generator, Gurney used an ingenious water tube boiler, burning coke. This boiler was a quick steamer, remarkably so when we recall the cumbersome boilers used on contemporary railway engines and the lack of experience which engineers displayed in boiler-making generally. The nature of the fuel fully guarded against possible nuisance from the emission of smoke. The whole coach was a beautiful piece of work, with graceful lines, which were well set off by the yellow and black colour scheme. Gurney tested the coach on the London-Bath road, over which it made several successful trips with passengers. Possibly the passengers disliked the vibration of the engine carried on the same vehicle as themselves. 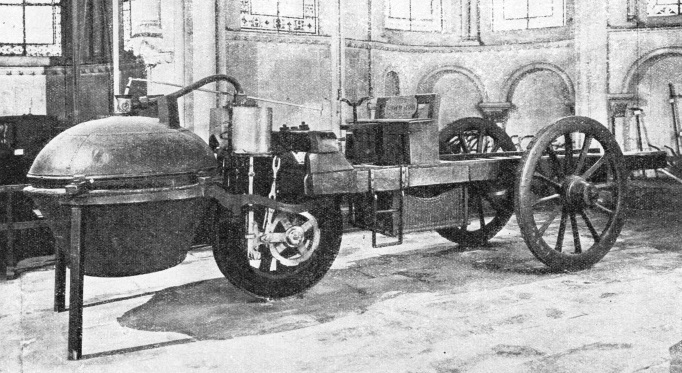 Anyway, in his second design, produced in 1829, Gurney placed the engine and boiler on a separate vehicle - in effect, a light tractor, to which a coach was attached as a trailer. On August 12, 1829, this strange conveyance ran from London to Bath and back, making the return journey in a little more than nine hours. Gurney did not receive the encouragement he deserved, and gave up his experiments in 1831. In that year Sir Charles Dance took over his coaches, and with them worked a four-times-daily service between Gloucester and Cheltenham, maintaining an average speed of twelve miles an hour. These brave beginnings attracted a great deal of attention, favourable and otherwise. Far-sighted people realized, even then, the great possibilities of the country motor coach. Shortsighted people, who were already reviling “that fellow Stephenson and his confounded railroads”, saw in the steam coach an even more insidious invader of rural privacy. But a Select Committee appointed to inquire into the possibilities of steam coaches gave a favourable report. They affirmed that the coaches were safe, light, as fast as stage coaches and less heavy on the road surface, as well as being good hill climbers. CUGNOT’S STEAM TRACTION ENGINE OF 1770 was built tor hauling heavy artillery. The two-cylinder engine is mounted over the single driving wheel and the boiler projects forward of the front wheel. The cylinders have a diameter of 12-in and a stroke of 12-in. The machine cost £800 to build, but was unsuccessful because of the faulty steering due to the disposition of weights over and forward of the guiding wheel. Walter Hancock, a contemporary of Gurney, was also much interested in steam coach design. He began his first experiments in 1824, but did not succeed in conveying fare-paying passengers before the energetic Sir Goldsworthy. The height of Hancock’s fame came at the beginning of the eighteen-thirties, just when Gurney was giving up. Before 1810, Hancock had built ten steam cars of various types, the later examples being most successful. He tended to favour the steam omnibus rather than the steam coach, and his best known vehicle, the Enterprise, resembled a motor bus of the early nineteen-hundreds, save that the engine was mounted behind the body instead of in front. Hancock’s machinery was extraordinarily advanced. In various early steam coaches we find features which are to-day considered essential points of modern practice. Hancock’s steam generator consisted of a light cellular boiler. For materials he used copper and gunmetal. The boiler was a marvel of compactness combined with good steaming qualities, so much so that modern motor engineers can claim merely to have revived lightweight propulsion, not to have introduced it. Some of the Hancock coaches were most efficient. His curiously named Infant first ran from London to Brighton on November 1, 1832. Unfortunately, it ran short of coke on the way and took a long time to reach its destination. On the return the average speed, including stops for coke and water, was as much as six miles an hour. In 1832 Hancock inaugurated the first regular urban motor bus service. His steam omnibus Enterprise was built for this service in 1833. It ran in London between Paddington (which had no railway station in those days) and the Bank. Between 1833 and 1836, when railways first reached London, Hancock carried more than 12,000 passengers on his Paddington-Bank service. In 1833 Hancock put another steam coach on the road. This coach, which had the rather gruesome name of Autopsy, ran between London and Brighton, making the journey in five and a half hours and attaining a maximum speed of thirteen miles an hour. That was faster than the maximum speed allowed for motor buses within comparatively recent years. Hancock’s calculations showed that the owner of steam coaches could make a profit of 25 percent over all running expenses. This showing, which should have stimulated wealthy coach proprietors, unfortunately alarmed other influential persons, who would stop at nothing to prevent the spread of mechanical transport. But in spite of threatening movements, engineers were busy on steam coaches at the beginning of the eighteen-thirties. Colonel Maceroni built several, in which he incorporated a wonderfully advanced lightweight water tube boiler, the tubes of which communicated with a steam drum at the top, delivering steam to the cylinders at a pressure of 150 lb per sq in. Dr. William Church was another pioneer with bold ideas, who set out to establish a regular steam-coach service between London and Birmingham. His second, and most important design took the form of a three-wheeler, with the single steering wheel in front and the engine in the middle, the engine weight resting on the two big driving wheels. Church used a rather heavy and cumbersome engine, and to prevent the weight of the engine from damaging the road surface he designed his wheels with exceptionally broad treads. Steam coach wheels were normally of wood, with iron tyres, and resembled those of the ordinary stage coaches, except that they were rather stouter. There is no evidence that they damaged the roads in normal conditions and probably, as the Select Committee had claimed, the pounding of horses' hoofs on the macadam surface was far rougher. Encouraged by initial success, Church designed a coach larger than any hitherto proposed, on the same lines as his existing three-wheeler, but big enough to carry fifty passengers inside and out. The coach was never put in commission, for the opening of the London and Birmingham Railway in 1837 convinced Church that his plans for mechanizing travel on the Birmingham road had come too late. COPY OF MURDOCK’S EXPERIMENTAL MODEL, which the inventor produced in 1782-86. In this engine a beam is carried by a post at the front and connected to the piston rod. A connecting-rod is carried down to the crankpin of the driving axle. The single-flue boiler was fired by a spirit lamp. The trouble, with early steam coach proprietors was that they saw in their vehicles a substitute for horse transport and for railway transport. Had they tried to introduce steam road coaches as feeders to the new railways in districts where branch lines would have, been unremunerative, there is little doubt but that the rich and influential railway companies would have given them all the backing they deserved, and enabled steam coaching to prevail against its more reactionary enemies. Only to-day are we realizing the meaning of transport co-ordination which, from a scientific point of view and from the travelling public’s point of view, should be in every way superior to cut-throat competition. Remarkable steam coaching developments took place in Scotland about 1830. James Nasmyth, whose name has gone down to history in other branches of engineering, was early on the scene with a steam car which he operated between Edinburgh and the Queen’s Ferry (Dalmeny) for the carriage of anyone bold enough to take a trip. Nasmyth’s car was not an outstanding vehicle. For propulsion, he installed a vertical engine and boiler at the back, the pistons imparting their motion through overhead crossheads. The arrangement somewhat resembled that of the historic railway locomotive Novelty of 1829, which was matched against Stephenson’s Rocket. Nasmyth was evidently not struck with his own invention, for after a while he scrapped the coach and sold the engine for stationary duties. But Scotland saw one of the most remarkable developments of all in the work of John Scott Russell. Nasmyth’s steam car had been a simple experiment; Russell set out to produce an efficient means of urban or interurban road transport, and in this, for the time, he succeeded. Russell took the stage coach as his model, reinforcing its undercarriage and springing to support the heavier weight of the machinery. The springing alone showed that Russell had remarkable knowledge of the dynamics of a more or less heavy vehicle passing over an uneven road surface. As Gurney had done, Russell placed his machinery behind the coach body, in the place of what would be the after boot of an ordinary coach. For a motor he installed a two-cylinder vertical engine, with gunmetal cylinders of 12-in diameter and 12-in stroke. The piston rods came through the tops of the cylinders, the crossheads moving up and down above them. From the two cross-heads connecting rods came down to the crankshaft, on which were mounted the eccentrics working the valves. The crankshaft was geared down to the driving axle at a ratio of 2 to 1. Perhaps the most remarkable thing about Russell’s design was the gearing of the driving axle. To allow for the variation in revolution speed of the two driving wheels when rounding corners, Russell fitted two clutches whereby either wheel could be thrown out of gear. His carriage was thus able to turn sharply without skidding or damaging the road surface. In this he anticipated by many years the differential of modern motoring practice. Russell fitted a steam generator which was a miracle of compactness, and which attained a remarkably high degree of thermal efficiency. His boiler was rectangular in shape and built up of copper plates. The firebox and smoke-box were placed at the same end. At the opposite end he fitted a square combustion chamber, the flues passing from firebox to combustion chamber and from combustion chamber to smoke-box. From these the fumes escaped to the outer air through a tall chimney, draught being induced by the exhaust from the engine. The steam pipe opening was in a raised steam space, corresponding to the dome of a modern locomotive boiler, through which the chimney passed, giving the steam a slight degree of superheat. With this boiler, it was possible to raise steam to working pressure within the surprisingly short time of twenty minutes. THE FIRST STEAM COACH, resembling a steam-driven stage coach, was invented by Gurney in 1827 and ran between London and Bath. The ingenious water tube boiler, fired by coke, was placed in the hind boot of the carriage, from which projected the flues. Steam was delivered to the two driving cylinders placed under the body. Accommodation was provided for six passengers inside and twelve outside. Against shocks from inequalities in the road surface, Russell mounted his machinery on a set of S-form laminated springs (springs made of thin metal plates), the coach body itself resting on the more usual C-shaped coach springs. The fuel was carried on a two-wheeled tender behind the main coach. Seats were mounted on this tender for additional passengers, the arrangement recalling that of a dog-cart. Both coach and tender were finely decorated, and the internal fittings and upholstery were on a noteworthy and lavish scale. Russell had six steam coaches built to this design by the Grove House Engine Works in Edinburgh They were completed in the spring of 1834 and in April of that year the designer inaugurated with them a regular hourly service between Glasgow and Paisley The distance is seven miles, and the coaches were easily capable of covering it in thirty minutes at an average speed of fourteen miles an hour. The coaches immediately gained a great measure of popularity with the travelling public, and were generally crowded with passengers, who hung on to the sides of coach and trailer in addition to occupying all the seats, inside and out. The local authorities, however, watched Russell’s success with an unfriendly eye. Their workmen were instructed to spread a thick layer of loose stones over the surfaces of the roads along which the coaches passed. All that happened was that the existing horse-drawn traffic was held up, and had to be taken round the obstruction. The steam coaches went crunching through the loose stones without delay or mishap. How far the ingenious Russell might have gone we shall never know, for a sad accident overtook his enterprise. Probably the overcrowding of the coaches was responsible for the accident. Whatever it was, one of the coaches was upset through the breakage of a wheel. The vehicle heeled over, and the bottom plates of the boiler came into violent contact with the ground. The boiler immediately exploded, blowing much of the coach to fragments and causing heavy casualties among the passengers. The authorities promptly ordered Russell’s remaining five coaches off their roads at once, and a splendid beginning was brought to an abrupt and untimely end. Two of the displaced coaches were brought to London, where such vehicles were still tolerated. They made occasional trips to Kew, Windsor and Greenwich. For a while, too, one of them plied between Hyde Park Corner and Hammersmith. There were various reasons why these earliest motor services - for motor services they were - came to an end. Perhaps it was the Turnpike Trust that gave the infant industry its fatal blow. The Turnpike Trust consisted of men intolerant of change. Many of them still did not believe in the ultimate success of railways, and they were determined not to allow steam engines on the public highroads. They could not forbid entirely the use of these steam engines, but they adopted the old plan of taxing them out of existence. Though it had been proved that a steam coach did no more, probably less, damage to the road than a coach and four, the Turnpike Trust had the price of a steam coach licence made twelve times that of a coach and four horses. The industry had been dead many years when the repressive Act of 1865 was passed. Under this Act every road locomotive had to be preceded at a distance of one hundred yards by a man on foot carrying a red flag to warn passengers of the locomotive’s approach. The speed limit was fixed at four miles an hour. The development of heavy traction engines, it is true, was not unduly impeded by this Act. The large steam tractor gained rapidly in popularity from the eighteen-sixties onwards, but most of its activities were of an agricultural nature - hauling steam ploughs by means of revolving drums and steel cables, working threshing machines, and so on. Steam tractors used the roads, as a rule, when they were making their way from one farm to the next, or transporting newly-felled timber. In neither instance was speed necessary or desirable. A number of Mid-Victorian inventors designed steam passenger coaches, in the interests of experiment, and some of these were cruder than the coaches of earlier days. There were a “steam dog-cart” and a “steam brougham”,' in which the passengers sat on a narrow leather seat with a huge coal-fired boiler almost on top of them. It was not until the early years of the present century that road motor vehicles reappeared in any numbers on the roads of Great Britain. Had their predecessors been given a reasonable chance, there is little doubt that mechanical road transport and railways would have grown up side by side and many economic transport problems of to-day would never have occurred. HEAVY ORNAMENTATION was one of the outstanding features of the steam carriages designed by William Church. In 1832 he inaugurated a service between London and Birmingham, but this was suspended when the railway was opened a few years later. Two types of vertical boiler were invented by Church to provide steam for his carriages, which were three-wheelers.